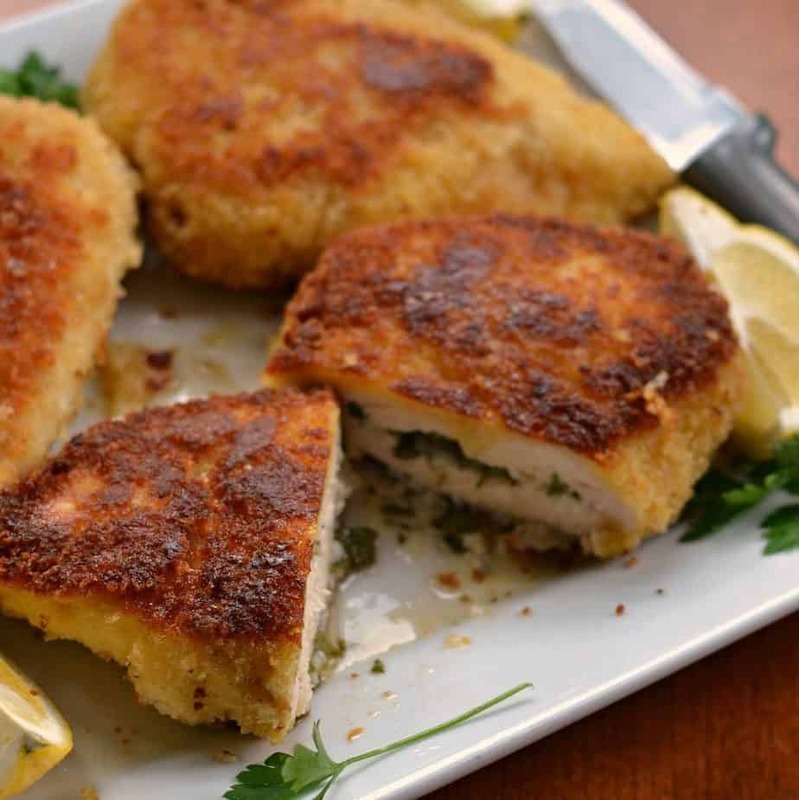 Chicken Kiev is crispy breaded fried chicken breasts that are stuffed with garlic lemon butter. The end result is amazingly tender flavorful chicken with a delicious butter sauce. 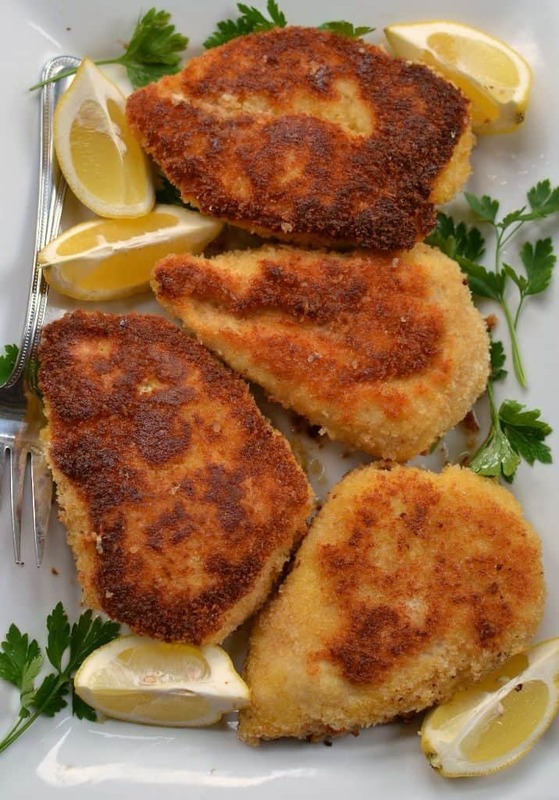 Chicken Kiev is one of my favorite chicken recipes. It is absolutely scrumptious and absolutely doable at home. I mean honestly who isn’t going to love a chicken breast that is crispy on the outside, so tender on the inside and full of drool worthy butter sauce. Now take that knife and slice it open and let the butter sauce run all over the plate. Sounds so delicious doesn’t it? Are you hungry yet? Dip a slice of that chicken into that butter sauce. Can you taste it yet? Chicken is a must have around here. We eat chicken at least twice a week. Chicken is so incredibly versatile, easy to work with and less expensive than a lot of other choices. Here are some more fabulous chicken recipes for your repertoire. Here are some helpful hints to make this Chicken Kiev epic. You want chicken breasts that aren’t too thick or too thin. Too thick and they won’t cook all the way through. Too thin and you won’t be able to slice a pocket for the butter. Double bread the chicken breasts for extra crispy crunchy crust. It is well worth the effort. Use fresh parsley. It just tastes better in this recipe. Secure the opening to the pocket with a toothpick or two. It helps to keep that butter contained. Chicken Kiev is so exquisite. A little slice of heaven in an other wise crazy world!! 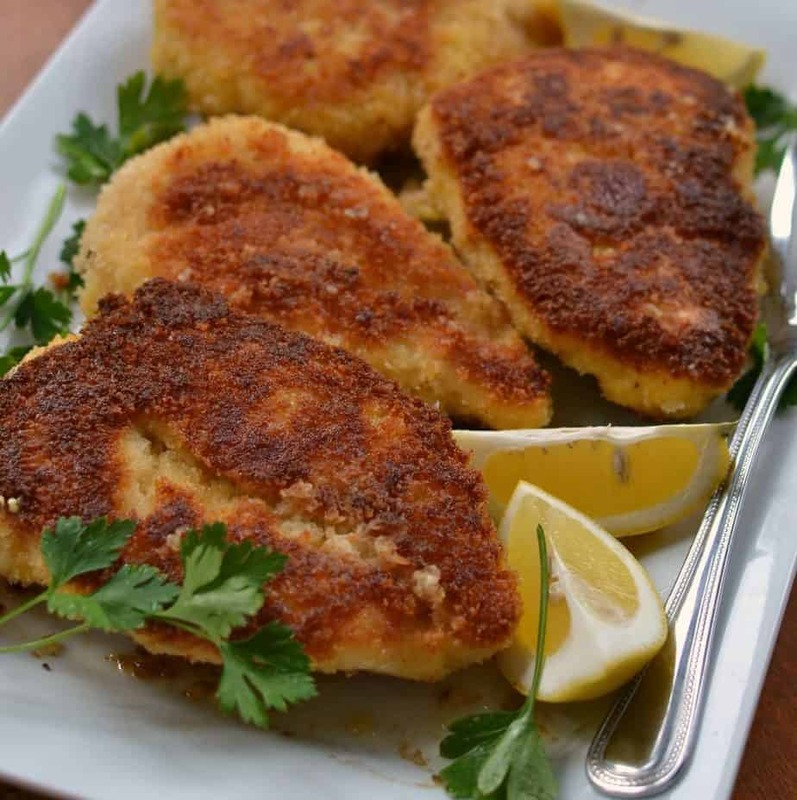 Chicken Kiev is crispy breaded fried chicken breasts that are stuffed with garlic lemon butter. The end result is amazingly tender flavorful chicken. In medium bowl using fork mash together butter, garlic, parsley, lemon juice, salt and pepper. Cover and place in refrigerator for thirty minutes. Cut small pocket (about 1.5 x 2.5 inch) in each chicken breast being careful not to cut through the top or the bottom or all the way through. Place 2 tablespoons of the butter in each chicken pocket and secure edge with toothpick. Dredge each chicken breast in flour, then in egg mixture, then in breadcrumbs, back in egg mixture and into the breadcrumbs once more. Place on cookie sheet, cover and put in freezer for 30 minutes. Drizzle with lemon wedges and garnish with extra chopped Italian parsley. Some thicker chicken breasts may require additional time in the oven loosely covered at 375 degrees until no longer pink. Be careful cutting into them as they come out of the frying pan as they are stuffed with hot butter. Always a big fan of easy chicken recipe. Your recipe is quite similar to mine and the kids love it. Thanks for sharing. Love chicken Kiev but I never cooked it myself! Maybe I’ll start now 😉 Thanks for sharing the recipe! Hmmmmm This Fried Chicken Kiev looks soooo delicious. Can’t wait to try this at home. I never tried the chicken Kiev and this prompted me to tackle this one tonight for dinner. Yes!! Thanks for posting. This reminds me so much of my moms cooking! I hope your family loved it! To be honest, I am surprised how low the calories are, and even the fat surprised me. Fried and filled with fat, I would expect it to be higher. Chicken Kiev is one of my childhood favourite recipes that up until now I thought I had to avoid. Guess what we are having for dinner. 🙂 Thanks. 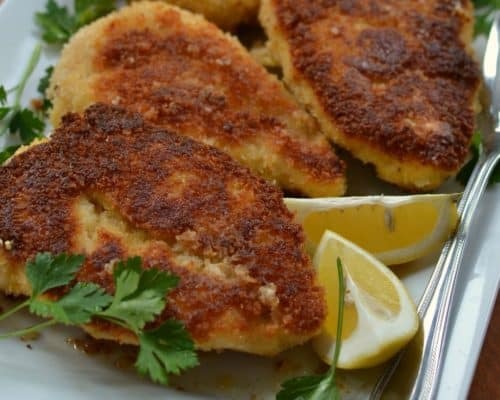 Chicken kievs are a popular meal in our house so I must give this a recipe a try – I usually buy some from the shop but it would be great to have some homemade ones instead. Anything about chicken is good for me and for my family and your recipe is so delicious and look so easy to make. I will definitely make this dish for our dinner, tonight. Thanks for sharing! This sounds like the perfect dinner for a busy night. I love the sounds of this one and will be putting it into the rotation. I love chicken and love how cripsy these chicken are. I am going to try out soon. I strongly agree with you, chicken meat is much affordable than the others and it taste so good that i can’t get enough. Trying other recipe would be so great. This sounds like the perfect dinner for a Friday night! This dish is crisped perfectly! Stuffed chicken breasts are delicious! I’ve never tried chicken Kiev before but now I just might. Pinning! Yummy chicken kiev! It’s full of flavors and healthy. Thank you for sharing your recipe. Oh wow, this one is a winner. I would love to try making this. My boys would absolutely love this. I hope they love it as much as we do! I have a fascination with trying new chicken dishes and would love to prepare this recipe soon. Looks absolutely fantastic!! This is a meal my whole family would love..delish! Oooooo love the sound of the garlic lemon butter inside these. We’ve never made kievs but might give it a go! Oooh, I can totally go for this right now. Looks so good! Bookmarking to make later.